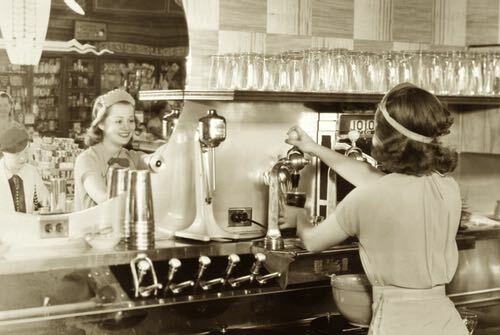 Use these old time straight soda recipes to make authentic fruit flavored sodas that were once served in pharmacy soda fountains throughout North America. These carbonated beverages are truly refreshing and fun to serve. A plain or straight soda consisted of a mixture of carbonated water and flavored fountain syrups that tend to be acidic in nature and do not harmonize with milk or cream. Syrup flavors such as orange, lemon, grapefruit, raspberry, cherry, and so on are popular. Fresh fruit was sometimes used as a garnish. You can make your own fountain syrups from scratch, or you can purchase authentic syrup concentrates in a variety of flavors from The Prairie Moon Company (see link below). 1 ounce orange syrup, 1 fluid dram lemon juice, 1/2 ounce raspberry syrup, 1/2 glass shaved ice. Add several ounces of carbonated water, sir well, strain into an 8-ounce glass, and fill the latter with plain soda water, coarse stream. Serve with two straws. 2 ounces grape juice, 1 ounce strawberry syrup, 6 rose leaves and 6 mint leaves crushed well against the side of glass with 1/2 glassful cracked ice. Stir thoroughly, then add carbonated water, coarse stream, and serve in a tall lemonade glass. Decorate with cherries and a slice of lemon. Price—12 ounces, 15 cents. Into a 12-ounce glass two-thirds full of shaved ice pour one-half ounce of pineapple juice, and 1 dram each of lemon juice and raspberry vinegar. Fill glass nearly full with carbonated water (coarse steam) and garnish with a strawberry and a slice of fresh orange. Serve with spoon and straws. Price—10 ounces, 10 cents. Into a 12-ounce glass place three-fourths ounce each of strawberry, raspberry, and orange syrups, juice of one-half lemon, and one-half glass shaved ice. Fill glass with carbonated water, coarse stream, mix with a spoon, decorate with fruit in season, and serve with straws. Charge 10 cents. 2 ounces orange syrup, 1 ounce raspberry juice, 1/2 ounce orange juice. Place in a 12-ounce glass one-fourth full of shaved ice. Shake well, fill with carbonated water, coarse stream, mix with a spoon, add a slice of orange or a small quantity of crushed pineapple, and serve with two straws. Price—12 ounces, 10 cents. This popular straight soda recipe calls for 1/2 glass shaved ice, 1/2 ounce raspberry vinegar, 1/2 ounce raspberry juice, 1 ounce crushed raspberry fruit syrup. Pour solid (without mixing), using sufficient carbonated water to fill glass; stir gently. Price—8 ounces, 5 cents. 1/2 ounce pineapple syrup, 1/2 dram lemon juice, 1 dram raspberry vinegar, 1 teaspoonful powdered sugar. Fill soda glass two-thirds full of fine-cracked ice, put mixing spoon in glass and turn on coarse stream of carbonated water. Fill nearly to the top of the glass and stir with spoon, adding more cracked ice. Over all place a teaspoonful of crushed raspberry and insert a small piece of orange between the ice and glass. Serve in ordinary thin soda glasses with straws. For this straight soda recipe, you need 1/3 glass shaved ice, 1 dash strawberry juice, 2 ounces strawberry syrup, 2 teaspoonfuls crushed strawberries. Fill with carbonated water. Stir with spoon and add four halves of strawberries. Serve with spoon and straws. Two ounces of sweet cream added to this formula might enhance its delectability. Add cream to syrup, then add the juice, and fruit. Pour into a 12-ounce glass 1 ounce of strawberry syrup and 2 ounces of grape juice and fill the glass two-thirds full of shaved ice; break into the mixture a few sprigs of mint, shake thoroughly, fill with carbonated water, mix with a spoon, and decorate with fruit, etc. Price—10 ounces, 10 cents.